Don’t let the delicate look of these hors d’oeuvres fool you. A touch of cayenne gives them a hint of heat that makes them a tasty accompaniment to a pre-dinner cocktail—or even a cold beer. Pulse cheese, flour, butter, salt, and cayenne in a food processor until mixture resembles coarse meal. Add milk and pulse until dough forms a ball. Bake, switching position of sheets halfway through baking, until pale golden, 15 to 18 minutes. Cool completely on baking sheets on racks, about 15 minutes. 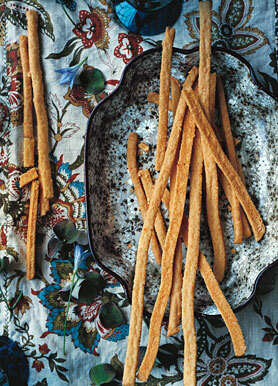 Cheese straws can be made 2 day ahead and kept in an airtight container at room temperature.